Women’s mtb ride every Wednesday at 5:45pm. Rides will alternate between riding local from the shop and driving to USFS lands further west. This is an all levels, no drop ladies ride. Also, we ride every Tuesday, year round. Rain, snow, sun, night, whatever. You could say, rather, you SHOULD say that we are junkies. Gotta ride. EVERY Tuesday with very few exceptions. Rides are expert level mountain bike rides. If we’d ride it in the day, we’ll ride it at night. General criteria for our rides is that A) we don’t like to drive more than 1/2 hour (LOTS of terrain within a 30min drive) and B) the Oskar Blues kitchen closes at 10pm. We’ve been known to blow those criteria from time to time! 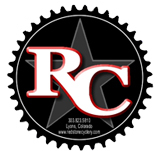 Rides meet at Redstone Cyclery at 6pm in the winter months and 5:30pm whilst DST is in effect. We carpool from the bike shop. We also have been known to lead up some crusher weekend rides as well. If this kind of riding sounds fun to you, keep checking in. We do a lot of our ride pimping on Facebook, so make sure to follow us there!